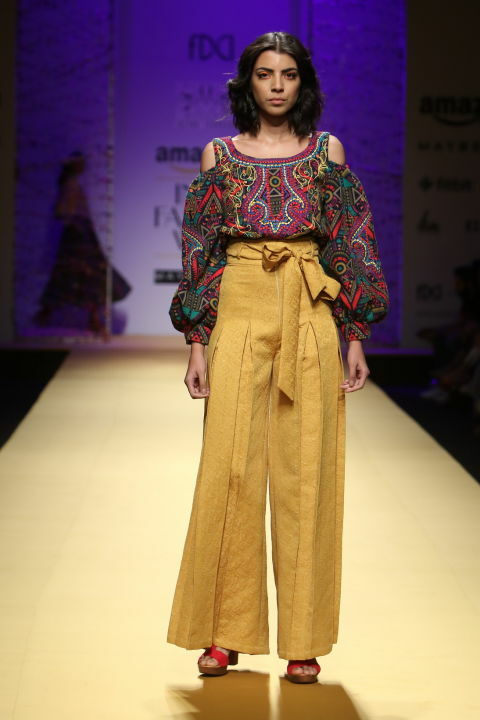 Madness continued on day 3 of Amazon India Fashion Week and we witnessed some really good designs from our beloved designers. Well if you are wondering what am I wearing on each day of the fashion week then you can check my social media handles or else stay tuned as by next week, I will be posting blogs around what I wore. The first show that took our heart was the lovely and breathtaking Jewellery by Mine of Design which is inspired by the memoirs of the Sea and secondly there were some extravagant jewellery pieces by Vasundhara that complimented the earthy vibes. 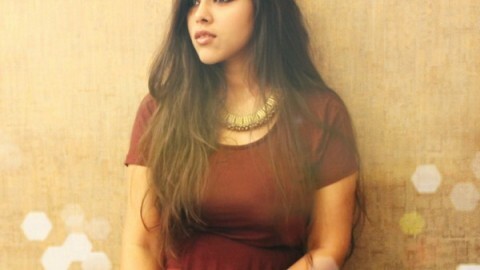 From body chains to huge and luxurious headgears, these are the kind of Jewellery that augments your closet envy. 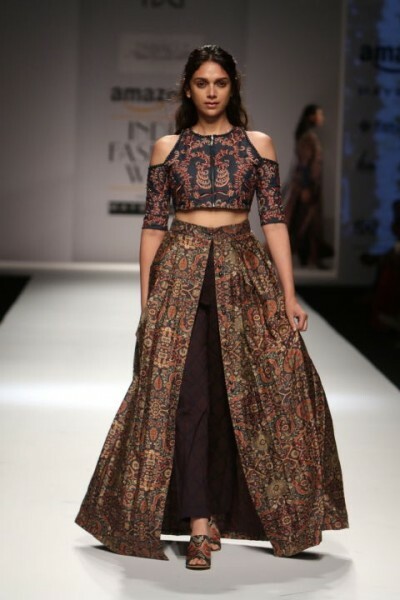 The next eye popping show was of Shruti Sancheti, especially when Aditi Rao Hydari walked in a lavish crop top and skirt by the former mentioned designer. 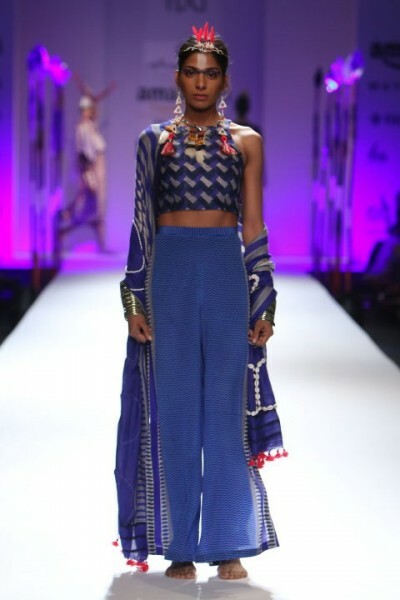 Her designs had some dull moments primarily because of the prints used but some of the pieces from the collection were really good in terms of the designs created. Well, do you know what Coachella is? Well in simple words it is a kind of fashion that is offbeat and leaves you wondering what did you just see? 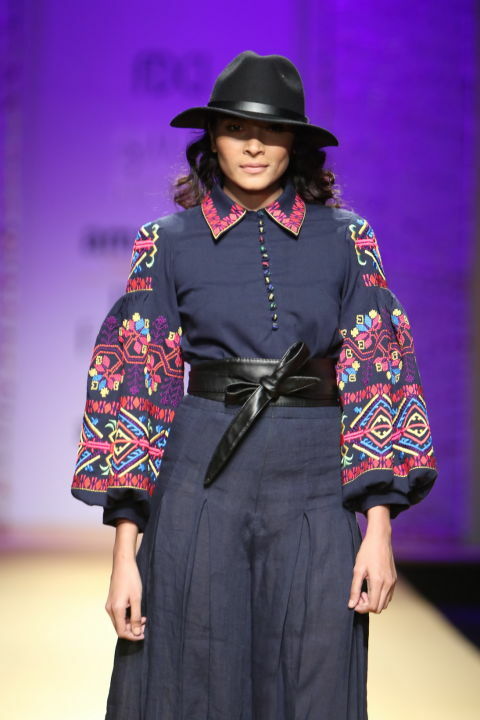 It has bold colours with ecstatic prints and so was the theme of Mynah by Renyu Taandon. 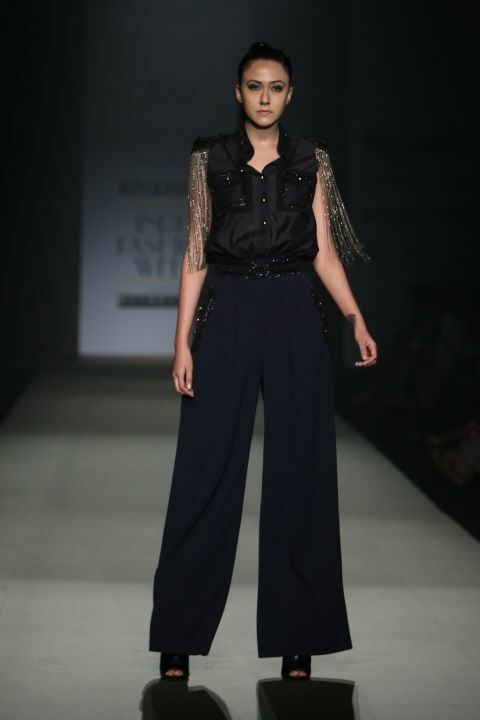 Girls, it is a super chic fashion that has to be worn at least once if you are the one who plunges on a sober side. Well I am not much of a fan of those prints in an outfit which does not compliment each other. 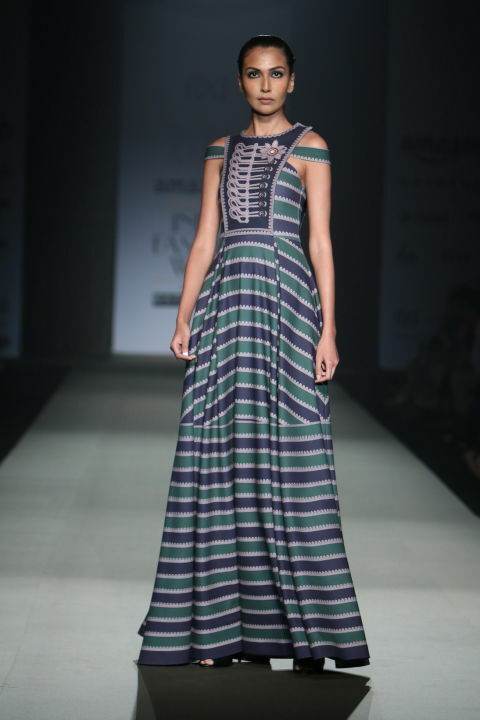 I have always loved the prints and designs of Anupama Dayaal but in the current show her inspiration being tribal and stripes there was only an outfit that we loved among the rest. 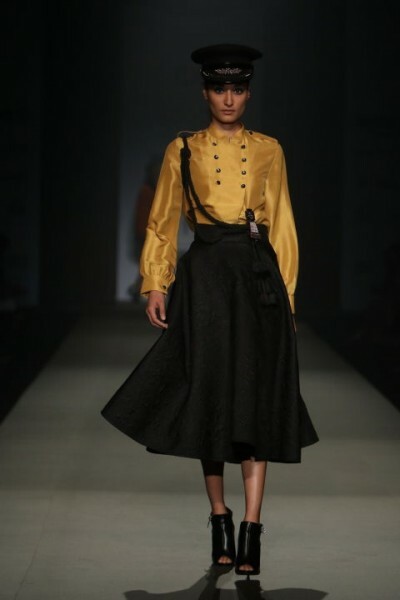 The show that took our heart was of Pankaj and Nidhi, they have drawn inspirations from attires of European Cavalries of the 18th and 19th centuries during which the splendour of martial uniforms were at the highest peak. 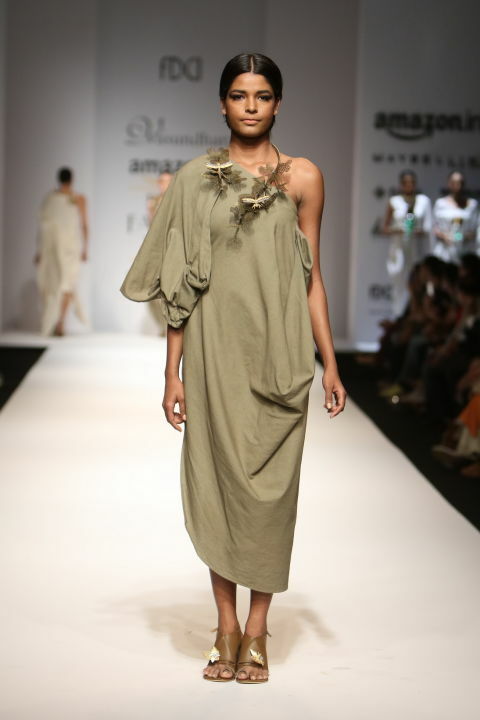 They have used palettes of greens and blues and earthy hues of olive and ochre. 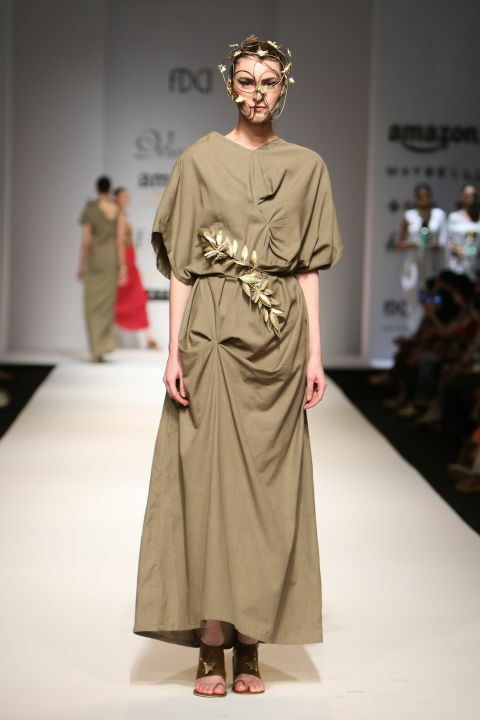 They have a range of elegant evening wear, that will surely leave a stunning effect on the onlooker. Stay Tuned as for more updates.